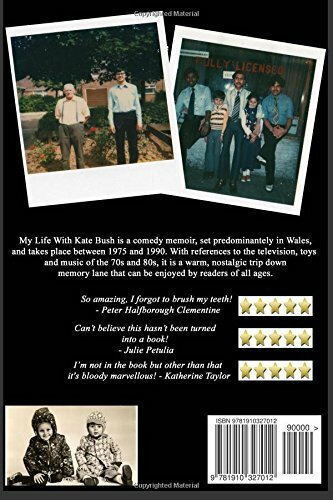 A comedy memoir set predominately in the 1980s. The book contains cultural references to television shows, music and toys of the era and is a warm and nostalgic romp through the past. The main protagonist, Riaz Ali, feels like the only Asian growing up in the small Welsh town of Cwmbran in the late 70s. He falls in love with a younger woman - she's 6 and he's 7, and collects Top Trumps and issues of Whizzer & Chips. One day in 1985 he goes to the cinema to watch Back To The Future, but before it is shown, the video of Cloudbusting is screened. From then on he becomes obsessed with Kate Bush. Oh, he also has an Amstrad CPC464 and loves to play Manic Miner, but never quite manages to complete the game. Throughout the 80s he has adventures, some funny, some sad, mostly with his school friends. He attends the 1988 Kate Bush convention in Haworth, West Yorkshire and again, another fan gathering in Glastomnbury in 1989. In 1990 he attends the official Kate Bush convention at the Hammersmith Palais in London, seeing Kate Bush for the very first time.